The filmography of writer-director duo, the Coen brothers (“The Big Lebowski,” “No Country for Old Men,” “Fargo”) is filled with unforgettable characters, dark comedy and a unique and inimitable style that is unmistakable. Their newest movie, “The Ballad of Buster Scruggs,” is no different. Although the film had a very limited release in theaters, it was available for streaming on Netflix around the same time of its theater debut. This is fantastic as it gives the film a wider potential audience who are more willing to give it a try from the comfort of their own home than they would be to go out to the theater and pay upwards of $10 to see a movie they have probably never heard of. I hope more independent filmmakers make their way to Netflix. “The Ballad of Buster Scruggs” is an anthology film in the Western genre. In other words, the film consists of six separate segments with different stories and different characters. As is common in films structured like this, there is a varying degree of quality as well as some minor tonal issues between the segments. However, these problems are nowhere near as distracting in “Buster Scruggs” as in other anthology films because the Coen brothers are the writers and directors of all six segments. 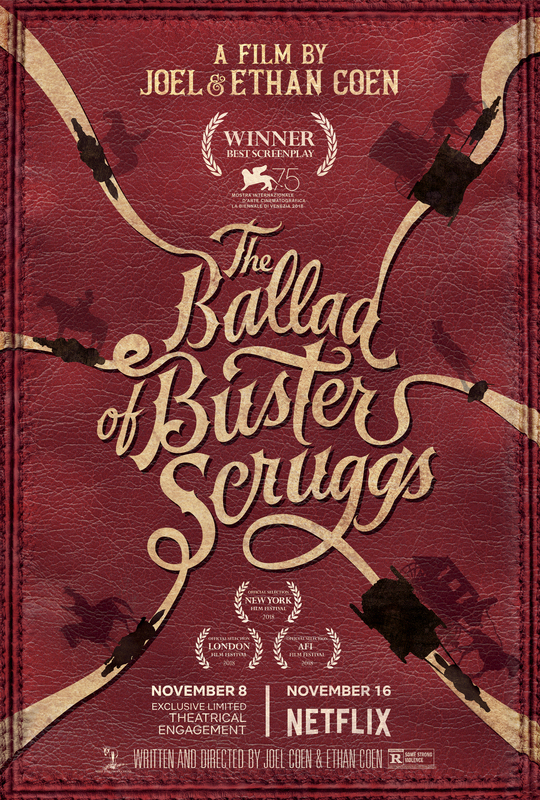 The film opens perfectly with the eponymous segment, “The Ballad of Buster Scruggs.” We follow Scruggs, portrayed marvelously by character actor Tim Blake Nelson, a Gene Autry-style singing cowboy with a quick trigger finger and perfect accuracy of Clint Eastwood’s Man with no Name. This segment is not only extremely entertaining, it also serves as a solid attempt to set a comic tone for the following segments. I highly recommend everyone find the 15 minutes or so to watch this as those I’ve talked to love the way the film started, even those who absolutely hated the rest of the movie. The next three segments are just as good, in my opinion. However, I feel uncomfortable giving anything away, because even a brief synopsis can completely spoil the experience of short films like this. The film starts to run out of steam during its last two segments. This is especially true of the fifth segment, which is by far the longest. It is not bad by any means, but it does drag quite a bit in the middle. The ending of this story is almost perfect, but it definitely could have been trimmed down a bit. As for the sixth and final segment, it is not poorly paced or boring in any way. Despite this, I can see most audience members just waiting for the credits to roll after the fifth story to the point where they may not enjoy this finale as much as they might have if it was not the finale at all. That being said, I do understand why this was chosen to close out the film based on its darkly comic tone and overall darker atmosphere in contrast with the opening. There are several aspects which tie together the six segments. Chief among these is the magnificent score from longtime Coen collaborator, Carter Burwell. While Burwell’s score is a treat for the ears, the cinematography by Bruno Delbonnel is just as much a treat for the eyes. The arid mountain passes, Old West towns and wide-open plains, which are the settings for the film’s stories, all look beautiful and full of life. This really is the perfect structure for a Netflix original movie. Viewers should take advantage of this and watch the various segments as they would watch a TV episode. They should not feel obligated to watch them all in one sitting or even watch them all in order. They should even feel free to skip to the next story if one is not keeping their attention. Netflix does not allow users to select which segment they would like to watch, but they should. Even without this feature, it would be easy for audience members to fast forward to the next segment, as it is made very clear when one ends and another begins. I am as certain as I can be that everyone watching will find at least one of the segments highly entertaining.